An international team from the Forschungszentrum Jülich and the Technical University of Munich led by Dr. Petr Cermak (now Charles University of Prague) shed unexpected new light on the abundance of magnetoelastic interactions in solids. Using inelastic neutron scattering on a single crystal of the rare-earth intermetallic compound CeAuAl3 revealed, that electron-phonon interaction can lead to creation of the new states in the matter, even in the case of small and hard to measure interactions. It will be 120 years since German physicist Max Planck laid down the foundations of quantum physics, a fundamental theory which has shaped technology of our everyday life. His work was so radical, that its implications are still at the frontier of present-day research. Already in the early days of quantum theory, Nobel prize-winner Max Born and his colleague Robert Oppenheimer suggested as an important approximation that the motion of atomic nuclei and electrons in condensed systems of atoms may be separated, because of their very different masses and speeds. This so-called Born-Oppenheimer approximation simplifies the complexities of the quantum mechanical equations and has become the foundation of much of current solid-state physics. Magnetoelastic effects, the coupling between mechanical deformation and the magnetic properties of solids imply that the Born-Oppenheimer approximation is no longer valid. These properties are often studied in magnetically ordered materials such as ferro- or antiferromagnets. Our research team focused on the behavior in higher temperatures, when the magnetic moments are not yet ordered. “Interactions between lattice vibrations and crystal field excitations are known for more then 40 years. It was always believed, that they are rare. Our research established, that the connection between the electrons in a solid and the atomic nuclei, which are over 1000 times heavier, is far more common. This was not appreciated because of the experimental methods used before,” said Petr Čermák, a post-doctoral researcher who is now working at the Charles University in Prague one of the leading places of this line of research, having performed these studies as an instrument responsible at the neutron source MLZ Garching, where he and his colleagues measured all the data. Perhaps most demanding in their study was the development a theoretical interpretation of the experimental data. “We have used theories which are older than me. Some of them were never experimentally confirmed. We were lucky that Professor Thalmeier, one of the founders of these theories of magnetoelastic coupling phenomena, is still active at the Max Planck Institute in Dresden. He helped us to understand much of the theoretical framework,”explained Čermák. The main reason why the effects had not been discovered before is due to the measurement techniques. Crystal field excitations were normally studied on powdered samples using time-of-flight spectrometers. Such measurement is quick and easy to refine, but you loose information about the detailed single crystal structure. The compound CeAuAl3was studied before with this technique, where nothing unusual was noticed. 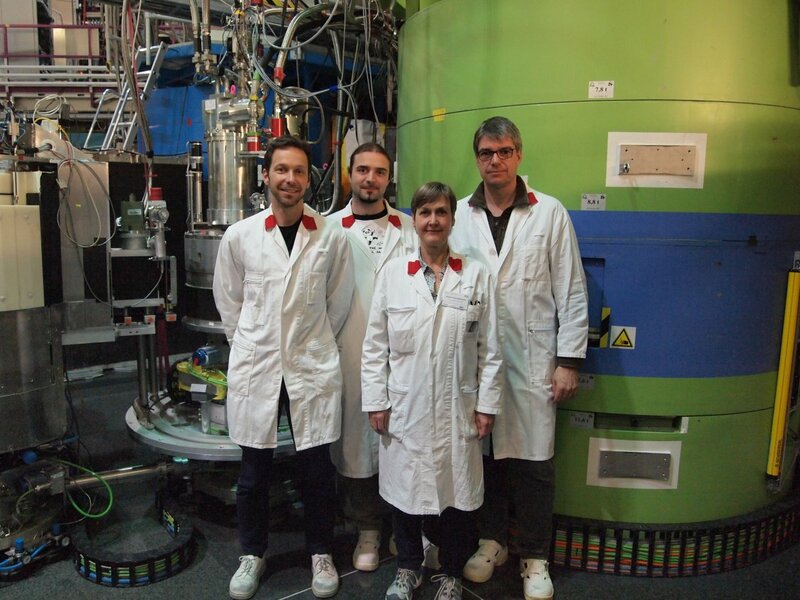 The Czech-German team used neutron triple axis spectrometers and studied physical properties on one big single-crystalline piece of material. Their measurement was much more time demanding, but they succeed to detect new hybridized modes not seen before. All measured data together with evaluation scripts in python are published together with paper under Creative Commons open license. Open data policy is still not standard in experimental physics, but it allows independent verification and reuse of measured data. Published results can have far-reaching consequences. An important area where the research of Cermak and collaborators promises to be important concern magneto-elastic functionalities of materials. The coupling could be used in electronic devices for data processing. A different topic of relevance concerns the origin of superconductivity with high transition temperatures as the magneto-elastic coupling may lead to superconductivity. “It is fascinating to see how neutrons interact at the same time with nuclei using strong interaction and with electrons using electromagnetic interaction. They are fascinating particles,” closes Čermák. Research was published in American multidisciplinary journal PNAS.